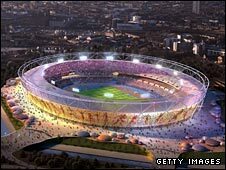 London's Olympic stadium is unlikely to be used by either a football or a rugby club after 2012. London 2012 bosses have been trying to persuade a club to move to the venue to ensure its financial viability. But no takers have been found and a new post-2012 "legacy" plan has emerged for the east London site. The favourite option now is to base a "sports academy" at the £500m stadium and also use the venue for athletics meetings and other one-off events. These could include music concerts, large conferences and even American football matches. "I was never sitting there saying football in, football out or rugby in, rugby out," said London 2012 chief Lord Coe. "What I was committed to was leaving a track and field facility that was capable of serving the community but also capable of staging events of a very high order and that is what we will end up with." "Legacy" has always been a key issue for London 2012's organisers - "no white elephants" is a pledge that has been made over and over again. But without a football or rugby "anchor tenant" there remains the danger the stadium could end up being just that. The London Development Agency and the Greater London Authority are leading the planning process for what happens at the Olympic Park after 2012. What should London's Olympic stadium be used for after 2012? In the next few months they will publish their "legacy master plan". A company, with the snappy working title of "Olympic Park Legacy Delivery Vehicle", will be set up to manage the site and its main role will be to make sure it breaks even. The key question now is: how can long-term viability be achieved without a football or rugby tenant to guarantee a steady flow of income? Much will depend on the success of the proposed academy, a sports college for up to 1,000 14 to 19-year-olds. Primarily intended for youngsters from the London area, there would also be opportunities for people from elsewhere in the UK to benefit from the expert coaching and superb facilities on offer. But the academy, an idea that has been pushed by Olympics Minister Tessa Jowell and London Mayor Boris Johnson, would not meet the stadium's running costs on its own. Additional sources of revenue will be sought, with the sale of the venue's naming rights being strongly considered. The stadium, which is on schedule to be finished in 2011, will have a Games capacity of 80,000 that is reduced to 25,000 for its post-Olympics use.